John D. has taken care of this position since March, 2015 and would like someone else to take over as Chair of Public Outreach for Intergroup. Please contact him if you have any ideas you want to help with for Public Outreach. He will be asking the entire Membership to get involved with some ideas soon. Contact him by phone at (818) 618-1501 or email at johndarnell8@gmail.com. Contact the press, radio and television and arrange for communication of Nicotine Anonymous message. Implement the business card program getting the hotline number to locations where it might be most useful. Provide notices and flyers to meetings and individuals who will place them in public locations. Chair the SCINA event, “Carry the Message Day”. Provide information regarding SCINA events to the Nicotine Anonymous World Services WEB page. You can help our Chair Person, John D. by sending him flyers you want sent out to the fellowship regarding your meeting or an event your meeting wants to host. Please remember our Tradition #5. Each group has but one primary purpose - to carry its message to the nicotine addict who still suffers. December 13, 2018 by Angela Pendergrass. Outreach to the public is a means of carrying the message about Nicotine Anonymous and reaching out to the still suffering nicotine addict. There are many avenues available to us for public outreach and to provide information about the program of Nicotine Anonymous. We can carry our message of recovery by informing the press, the media, schools, hospitals, smoking cessation programs and other health related facilities about what Nicotine Anonymous offers. Communicating the availability of recovery to the public, those who are afflicted, health professionals, and anyone else interested can bring the still suffering nicotine addict to meetings. By introducing new members to the fellowship, this activity has shown it helps to sustain membership in our meetings, while preserving the fellowship for newcomers in the future. Certainly, there is the added benefit that we ourselves will maintain freedom from nicotine by active participation in our primary purpose – carrying the message! 1. Serve as liaison between all requests for a Nicotine Anonymous panel and the volunteers who will go on the panel. A. Gather all information regarding street address, location within the facility and time for the panel. B. Solicit volunteers for the panel from meetings in the area of the facility. It is ideal to get 4 persons, 2 men and 2 women. However it may be a smaller group depending on the circumstances. Be sure each volunteer has the guidelines for sharing as well as the meeting and location information. C. Meet with the volunteers at a central place at the facility. Be sure to arrange that if anyone is late the rest of the group will go in and start the panel. Being on time with our commitment is important. D. Attend SCINA Intergroup Meetings on 3rd Sunday of the month and make any report requested. 2. Gather contacts at Hospitals and Institutions where we can send our Meeting List every month (via email if possible to keep our postage costs down). For example, anyone in our Fellowship could ask at their doctor or dentist's office if we could send them a copy of our meeting list every month via email. If they say yes, get their name, email address, phone number, and the business name and address and notify someone in Intergroup. Send that information to communications@SCINA.org and we can add them to our monthly mailing. Flyer we send out to Hospitals and Institutions offering our help. Flyer we make available to our fellowship to explain what a speaker panel does. Please contact John D. at (818) 618-1501 or communications@SCINA.org if you can volunteer to be the Chairperson for Hospitals and Institutions. Tradition 5: Each group has but one primary purpose – to carry its message to the nicotine addict who still suffers. 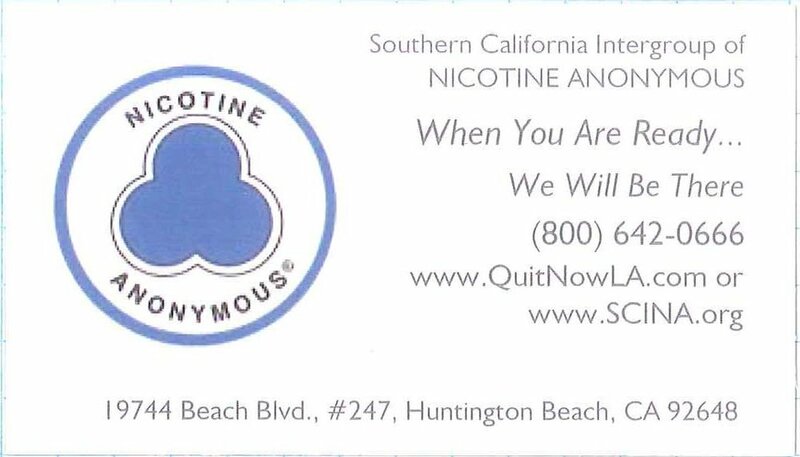 Thanks to your donations, SCINA (Southern California Intergroup of Nicotine Anonymous) has been able to have 5,000 “When You Are Ready” business cards printed to give to its members. Members can observe Tradition 5 by delivering Nicotine Anonymous literature and our “When You Are Ready… We Will Be There” business cards to hospitals, clinics, drug stores, supermarkets, doctor’s offices, dentists, coffee shops, churches, and fellowship halls throughout the Southland. If you wish to help, just send your Intergroup Representative to the Intergroup meeting at White Memorial Medical Center on the 3rd Sunday of the month (except September when we are at the picnic) to pick up free business cards. We will give sets of 50 business cards to the first 100 people willing to distribute, first come – first served, so please get signatures at your meetings. To spread the word, we hope you can purchase pamphlets and copy meeting lists to distribute. To really spread the message all year long, we hope you can ‘adopt’ some of these locations and stop regularly to leave literature and business cards (literature would be paid for by your group). Please ask them if you can leave free literature and business cards advertising our free support group helping people stay nicotine free. A few cards left at the counter might be allowed if you ask nicely every week or month where you shop. You never know where you might be a life giver to someone who needs just a nudge to become willing to try. For more information or to make sure we still have cards available, call Angela P. at (949) 302-8465 or email at angela.socal9@gmail.com . December 12, 2018 by Angela Pendergrass. If you are interested in taking on the 800 Number Coordinator Chair, or are simply interested in being of service at the Intergroup level, please contact George O. at (562) 310-0874 or email him at communications@scina.org. Responsibilities would include returning calls to voicemails left on our 800 line and providing information on our meetings. Our phone carrier was recently changed from AT&T to Grasshopper.com, which has made it easier to monitor the phone lines. We can now receive notifications via email or smartphone app when a voicemail is left on the 800 number. If you download the app to your smartphone, you can even return calls using your smartphone, but it will show the 800 number as the outgoing call instead of your cell number. This is a wonderful improvement. Again, please contact George O. if you are interested in helping with this commitment in any way. July 20, 2015 by Angela Pendergrass. a. Television. No reported submission or scheduled airing of public service announcements on public or private networks. A list of stations needs to be developed for future planning. There are currently 23 web sites listing resources for tobacco cessation programs, nicotine addiction, etc. Three of these sites have links to Nicotine Anonymous World Services. None of these sites have a link to SCINA.org. There were no public outreach events during the month of June. For July and August, there are no events scheduled in SoCal. There are currently 20 locations of tobacco cessation programs in Riverside and San Bernardino Counties. A complete list of events for the SCINA needs to be created for planning purposes. There were no requests for information, literature, or other outreach activities in the past month. The Hotline Coordinator was contacted, and stated there was already a process used for the hotline that did not include public outreach. a. Hospitals/Clinics. A list of hospitals and health clinics is being developed for future planning. b. Medical Professionals. A list of medical professionals is being developed for mailing letters, pamphlets, etc. c. Alcohol/Drug Treatment Programs. A list of treatment centers is being developed for future planning. d. Smoking Cessation Programs. A list of smoking cessation programs is being developed for future planning. e. Counselors/Therapists. A list of facilities/offices is being developed for future planning. a. Literature Table. Would the groups be served by having access to a package of information for use at events for an information booth? Possibly three for the SCINA area. b. Public Outreach Workshop. Would the groups be served with a workshop to encourage participation, share experiences, learn traditions used, and generate ideas for public outreach? c. Public Outreach Guide for SCINA. Publishing a guide for SCINA to participate in outreach activities at the individual, group, and intergroup committee level may help encourage members to get involved, provide stability to outreach, and help in abiding with our traditions. July 18, 2011 by Administrator.